The well-established Horizon® Family includes three different chamber sizes. All of them excel in their compact user-friendly construction. The safety interlock lid prevents an electrical connection until the lid is properly in place. 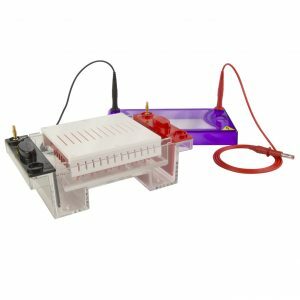 Gel casting works very fast with patented drop-in dams and can be done either directly in the electrophoresis device or in an external gel casting system. 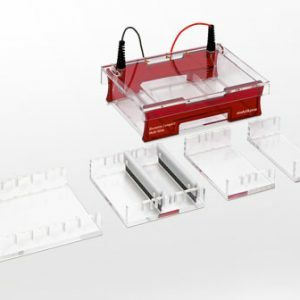 Red visualisation strips under the gel trays aid in sample loading. The medium and large format systems Horizon® 11•14 and Horizon® 20•25 additionally offer a special equipment to perform Southern and Nothern capillary blotting. 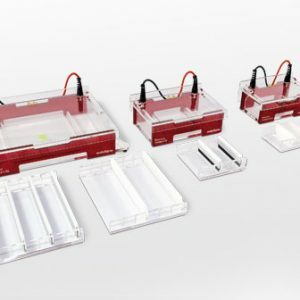 Horizon® 58 is developed for the rapid separation of nucleic acids in agarose mini-gels. Casting components that withstand boiling agarose temperatures and the removable buffer tray for easy cleaning make the Horizon® 58 the system of choice for rapid routine use. 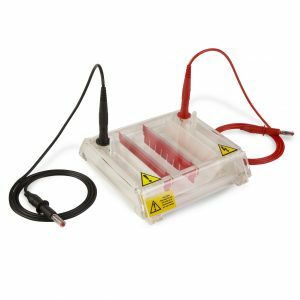 For storage combs and gel casting dams can easily be placed in the electrophoresis unit. A separate casting system is available and comes ready-to-cast with gel tray and casting dams. 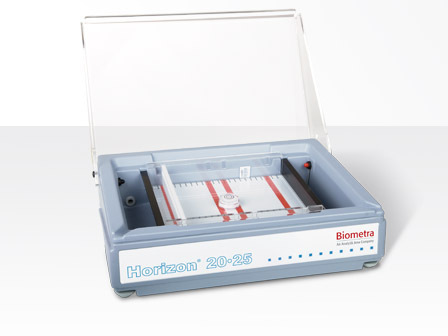 Horizon® 11•14 and Horizon® 20•25 have adjustable levelling feet and a bull’s eye level to ensure uniform gel thickness for reproducible separation patterns. The gel trays are UV transparent and thus can be directly placed with gel on an UV table for visualisation. Both models have ports for buffer recirculation, e.g. for RNA electrophoresis. The Horizon® 58 and Horizon® 11•14 casting systems come complete with gel tray and casting dams. The Horizon® 11•14 casting system can be levelled by four levelling feet. For the Horizon® 58 casting system an additonal casting/levelling tray is available.